10 Fun Ways to Relieve Stress & End Your Weight Loss Resistance: Anxiety and Stress Management Techniques You’ll Enjoy! Use these fun ways to relieve stress and weight loss will seem so much easier to you… Whenever you feel like eating for emotional comfort these ideas to bust anxiety and simple stress management techniques are super easy to implement in your busy schedule. 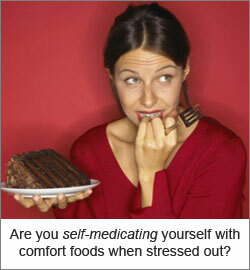 Are you wondering why should you do all you can to relieve stress – especially when you fight abdominal fat? Well, if you know about the effects of stress on health and body weight you know how chronic stress makes you unable to lose weight due to the release of cortisol, the fat-storing hormone. Chronic stress builds up not only because of overwork, physical fatigue or lack of sleep, but also when you experience feelings of anxiety, overwhelm, resentment, depression, guilt for long periods of time. Through the effects of cortisol, chronic stress makes you gain weight – especially in the abdominal area – AND it stops you from losing weight, even when you eat right and exercise regularly. Well, first of all, your body is in a fat-storing mode when cortisol levels are high. Second, if you are like most people, under stress you probably feel a strong urge to eat sweets or refined carbs, like chocolate, cookies, pasta, bread, pastry, right? These comfort foods increase your blood sugar almost instantly and this, in turn, triggers the release of serotonin and dopamine, the “feel-good” chemicals in your brain. So when you feel stressed out or want to ease your anxiety or depression symptoms, instead of unconsciously self-medicating yourself with fattening foods, choose one (or more) of the fun ways to relieve stress below. They are all simple anxiety and stress management techniques that you can easily do on your own. While it’s true that you can’t control most of the bad things out there that trigger your stress, frustration, anger or depression you CAN control how you react to them. …all these help you diffuse negative emotions at will. Most of all, use some of the ways to relieve stress below before you sit down to eat… Make sure you spend at least 10-20 minutes doing something that makes you feel good and above all, relaxed. 10. If you’re at your desk and can’t get away, consider using a desktop game for stress relief – it is not only one of the most fun ways to relieve stress, but a great way to bust the worries, anxiety or depression that trigger your emotional eating. A beautiful and incredibly calming stress reducer game is The Journey to Wild Divine, a super-fun stress-busting game. By using it a mere 15 minutes at a time you’re able to relax completely through your ability to control your mental focus, feelings, breathing and awareness.